The domestic gaming industry in India is set to skyrocket and may become a billion-dollar industry by 2015, with an expected CAGR of 31 per cent. 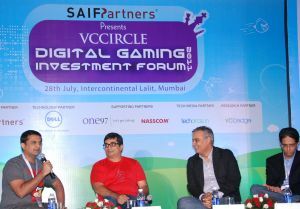 And proof of this tremendous pace of growth was witnessed at VCCircle's Digital Gaming Investment Forum, held on July 28 in Mumbai. The conference unravelled the exciting business models in gaming, such as social networking and mobile gaming segments, and the various innovations taking place. It also addressed serious issues concerning the sector, especially the current rules and regulations, monetisation and changing trends in usage and uptake of games across the country. The forum saw over 180 participants from varied sectors and backgrounds, from developers and entrepreneurs of gaming companies to private equity and venture capital investors such as NVP India, SAIF Partners, and large Indian gaming companies such as Hungama Digital Entertainment, IndiaGames, Ibibo Web Pvt Ltd, Nazara Technologies, One97 Communications, Games2Win and Reliance Entertainment. Executives from companies such as Zapak Digital Entertainment, Zynga, Chayowo Games, Dell India Pvt Ltd, Digital Chocolate, Play Games24X7 Pvt Ltd, Samsung Electronics and Synqua Games were also present at the forum. The first panel discussion, Investor Interest in Gaming Sector, revolved around the growth of gamers in India, comparisons with China and challenges facing the industry with regard to monetisation. Ravi Adusumalli, Managing Partner, SAIF Partners, noted that China enjoys a competitive advantage since the government supports their Internet companies far more than the government of India. And this China obsession was reflected throughout the forum. From the inaugural remarks through to the last panel discussion, panellists kept on lamenting how gaming was going great guns in China and how we were lagging behind. So you see, the Indian gaming industry is no different from other Indian industries. Speaking at the panel, Rajesh Rao, founder and CEO of Dhruva Interactive, noted, "There are 15.8 million gamers in the country and around 50 per cent of them are mobile gamers. Gaming in the country will be huge, once India starts witnessing a 300 to 400 per cent growth in broadband, primarily led by wireless dongles. The industry still faces diverse challenges, such as lack of monthly payment mechanisms and a reliance on telecom operators." However, Rao expects that the number of gamers will grow to 125 million by 2015. Entrepreneur Lalit Sarna, CEO of Gurgaon-based Oxylabs Networks, said that India should start building now, with a billion-dollar market perspective. Adusumalli raised the question of innovation by Indian gaming firms and how many companies were building products for the Indian market by taking the outsourcing path. The next panel -- VCCircle Red Hot Sector 1: Mobile Gaming -- brought forth the insight that Android is the new Nokia. Except for a gallant fight put up by Rajiv Hiranandani, CEO of Mobile2win, for 'dumb phones,' it was smartphones all the way and everyone was actually jumping for Android. Steve Jobs, please take note! The imminent and great mobile gaming revolution, expected in India, has ironically reinforced the great love and affection that the game developers have for telecom operators. There was not a single one around to face the flak at the forum. Steering the discussion was Vijay Shekhar Sharma, CMD, One97 Communications. Mohit Sureka, founder of Spiel Studios, and Rohith Bhat, CEO of Robosoft/99games, discussed their experiences with developing iOS games. The Social Gaming Phenomenon session was moderated by Rajesh Sawnhey, president of Reliance Entertainment, who said that India would have a variant of social gaming â€“ mobile social gaming â€“ since mobile users in India outnumber regular online users. Discussions revolved around evangelising the local marketplace, local payments, distributions and conversion rates. Paying users now have the same conversion rate as global trends, but Indian telcos' ARPUs continue to be low. Ashish Kashyap, CEO of ibibo, talked about how the opening up of ibibo's APIs was a success, with more than 12 developers on board. "Now it's all about how we can connect with people and get them to form relationships. We need to set up frictionless payment mechanisms, which will be the second level of evolution, and create our own cash card economy." Mohan Kumar, executive director of Norwest Venture Partners, Robin Alter, CEO, Kreeda Games, and Mukul Singhal, vice-president, SAIF Partners, animatedly discussed the growth of the services business by Indian gaming start-ups and the macro factors in the arena. According to Kumar, the gaming industry will have to go through three phases "the first being getting women to play games, the second is getting console-type gaming into social games and moving away from Facebook, and phase three is gamification â€“ making day-to-day activities game-like. Also speaking at the forum was Kalyan Manyam, founder & CEO of Mojostreet, who talked about how he was gamifying m-commerce with his new location-based service and why he was targeting BlackBerry and Nokia handset users. Energetic discussions ensued among Alok Kejriwal (co-founder and CEO, Games2Win), Vishal Gondal (CEO, IndiaGames) and Neeraj Roy (MD & CEO, Hungama Digital Media Entertainment) when the panel took up the topic â€“ The Challenges Facing The Domestic Gaming Market. Angry Birds, angrier developers. "Telcos are greedy", "VCs are wimps", "Customers are cheap" â€“ comments and remarks flowed freely. The next VC forum better have an anger management track! "Now, the typical Indian gamer is the chaiwallah, liftwallah and the army jawan and not the traditional 16-year-old from South Mumbai," said Vishal Gondal, CEO of IndiaGames. The company has recorded seven million downloads for its Aladdin game and 12 million for its cricket game. Bollywood and cricket were the hottest topics throughout the forum. According to many, the only 'Indian' content desi gamers will pay and play for is related to our national obsessions, and it will make both Yash uncle and Pawar chacha extremely happy. But Roy opined that India's obsession with localisation and creating 'Indian' games were passÃ©. You know something is not right when an industry, which has been around for more than a decade, still wants to talk about building the user base and eyeballs, instead of discussing hard cash. But as Roy said at the event, "We live in Hope." Manik Arora, founder & MD, IDG Ventures India, said that hope had been the predominant driver of this industry and that venture capitalists were taking bets on gaming start-ups on the basis of their individual judgement. The final session What We Want To Play took a peek at India's top gamers and what they wanted to play. Panellists discussed game genres â€“ skill-based, casual, action, role-playing, strategy, simulation and multi-player, and also which of the devices â€“ desktop, mobile or console â€“ was most popular for game-playing in India. The kind of pure love being exhibited at the event for Zuckerberg's offspring would make for a KJo romcom. Expect more Facebook frenzy from our desi developers. This forum was the first of its kind in three years and was lauded by attendees as a conference that set the bar and drew considerable interest from the Indian gaming industry. "Typically, all other gaming-related events in India tend to focus on the services side, looking at areas like animation. But this is the first event focusing on the other set of companies, such as product developers," said Nikhil Soman, founder of Dialify. The event ended on a high note, with more than 75 companies, a full house, comprehensive networking and chatter all around. Indian gaming must be doing something right to attract this traction. -By Rajit Ojha and Preethi J.